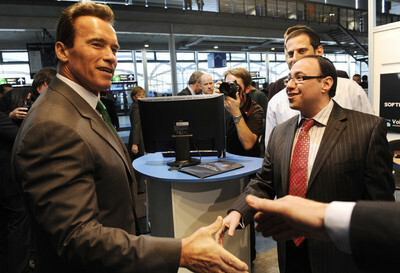 On the picture above the Governor of California Arnold Schwarzenegger is visiting us at our booth in Cebit. On the right is Voiceserve/Voipswitch’s CEO Michael Bibelman. Throughout 6 days of intensive work we met with more than 250 companies. They were ISPs, exisiting VoIP providers looking for extending they current offering and others from the broad sector of communication business. In addition we had numerous meetings with VoIP hardware manufacturers and service providers interested in technological partnership with Voipswitch which should soon be announced on our website. Also we would like to thank to all our customers that came to Cebit to visit us at our booth.